We were all, I’m sure, shocked and distressed by December’s gun attack on the Sandy Hook primary school in the USA, when 20 children and six adults were killed by a disturbed teenager wielding a gun. I was in America at the time, visiting my family. You can imagine what we felt when the headteacher of my grand daughter’s high school texted parents to say that he had received information of a similar attack, to be carried out at her school the next day. What should we do? Send her to school, or not? What would you have done? There followed hours of family discussion. It was obviously a hoax, wasn’t it? Or was it? My grand daughter, being a brave warrior girl, wanted to go and show these people they could not make her afraid. Her parents refused to let her go. The arguments ebbed and flowed. At first, I thought she should not go to school. Then, getting some perspective and thinking about the area, which is a peaceful one, I thought she should go. Then, my son, her dad, told me how practically every household in the canyon where they live, has guns for hunting - so they’re relatively easy to get hold of. Besides, as we know, it’s enshrined in the American Constitution that every citizen has the right to bear arms. My darling girl went to school the next day. Parents and grandparents waited anxiously for her hourly text that all was well. It was. Nothing happened. It was a hoax. Thank God. In my YA historical fiction, all my girl heroines are warrior girls, skilled and capable with different weapons. They fight, not because I think that is at all admirable, but because I believe it’s true to the history I write about. From the Iron Age to the Middle Ages, women were expected to defend themselves and their homes against armed enemies, especially during those times when the men were called away to fight for their liege lord. Heroines wielding bows and arrows have become a bit of a cliché in historical fiction, but I make no apology for my latest 15thc. heroine, Elinor, being a skilled archer. According to Robert Hardy, in his wonderful treatise, ‘Longbow; a Social and Military History’, every able man was expected to be adept with a bow, and, no doubt, able to make one, from whatever materials were at hand. Would this not also be the case for able and willing women? I just thank heaven it isn’t the case today, that we must all attend butts practice on Sundays, and no longer have to stand ready to defend ourselves with weapons. Though, as my son said, when my granddaughter’s school was threatened, what do you do when someone comes to your home or work place with a gun? In America, after the Sandy Hook massacre, there was a huge surge in the sale of guns, because people wanted to be able to defend themselves. Horrifying, isn’t it? 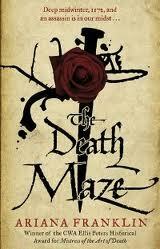 At the moment, I’m reading ‘The Death Maze’ by Ariana Franklin and enjoying it immensely. When Henry II’s favourite mistress, Rosamund, is murdered, some say by his jealous wife, Eleanor of Aquitaine, England’s first anatomist, Adelia Aguilar, is called upon to investigate. I love the characters and all the historical details.And looking out for any weapons. Best wishes to all you history buffs! This is fascinating...and I think I'd have erred on the side of caution in the matter of going to school. But v, interested in Eleanor of Aquitaine link in that novel. I'm going to be writing a story about her very soon. Is there a lot about her in the book? How horrible and frightening for you all, Pauline! And like Adele, I think I'd have erred on the side of caution. The rest of your post is very thought-provoking. It's something I often think about and feel concerned about - and which definitely needs more attention than I can give it here, with a deadline looming! Thanks for a fascinating and thoughtful post. I understand your reasons for creating heroines skilled in arms, as it is based on historical research. However, there is another purpose, it seems to me, in doing that and it comes in many ways from mythology. In mythic terms (and to fictionalize the historical past and populate it with imaginary characters is surely a modern form of mythography? )the gaining of the sword, or the magic ring or whatever it may be, is the symbol of transition from childhood to adulthood, the symbol of 'coming into your power' as a fully wilful and responsible person. As such it has powerful resonance in YA coming of age tales. Further, this mythic quality, this bearing of the sword, is a great dichotomy for young people to struggle with (even unconsciously)as they must learn to discern and employ the power well. A sword can kill and maim; it can also defend and, as a surgeon's scalpel, cut the bad away from the good. Finally, I applaud you with all my heart for creating powerful female heroines with which our young readers can identify. That alone is a much needed gift in our times. Thanks for this post - it's hard to imagine all the guns in the US, and all the danger, but your story brought it very close. Makes me want to hug my grandson! She's very much part of the action in 'The Death Maze'. I'm 2/3rds of the way through and she's planning an uprising against Henry, at the moment, having gloated over the death of his favourite Mistress Rosamund! Terrific woman, v.strong and ruthless. Mother to five boys too! Thanks, Adele. What was especially disturbing to me was the way Americans take guns for granted,as part of their everyday experience. There are armed police on my granddaughter's high school campus every day. On the day of the threatened attack, more armed police were drafted in. It's hard for me to accept! Thanks Austin, for casting a different light on the topic, and for your kind words about my heroines. I love the idea of myth and symbolism in fiction, especially 'the hero's/heroine's journey'in which he or she has to fight against obstacles and enemies to gain self-knowledge and growth. Thanks, Ann and Maxine. I wonder if we're not just very lucky, in our part of the world, not to have to train our children in the use of weapons. Thank heaven for it!